The MSN Messenger service went down again tonight, but the problems should have been solved for most of you now. Movie Trailers & More released! A new launchsite menu item was released today, Movie Trailers & More. This contains: yes, you've guessed it, movie trailers! There is also links to get movie showtimes and tickets. However, next to a lot of trailer fun it also eats a lot of your computer memory & lags msn messenger for at least 10 seconds. Media Republic announces its latest spectacular project: the 24-7 Reporter, starring Dutch superstar and superbabe Katja Schuurman! The next step in real life celebrity soaps, 24-7 Reporter is a service whereby people can follow her exciting life, 24 hours a day, 7 days a week, via Internet, MSN Messenger and on your mobile phone! April 21st will see the launch, brought to you in cooperation with HotSMS and The Fame Game, MSN and Axe. If you are living in the UK, you probably found out that the MSN Members profile site has been disabled. To re-enable the profile pages in MSN Messenger we have written a patch. Point your mouse over here, and click. MSN HandWriting, the most downloaded file on Mess.be after Messenger Plus! 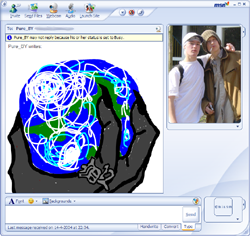 2, that allows you to send handwritten messages via MSN Messenger 6 (also called 'ink messages') is updated to version 1.1. The installer has been redesigned to check you for Ink Redist installed and your version of Windows. A number of messers have noticed problems whilst attempting to sign into MSN Messenger. This is due to server downtime as changes to the service are taking place to prepare for the upcoming release of MSN Messenger 6.2. Please be patient! Our online webchat has been improved! So visit for all your burning questions regarding MSN Messenger, the meaning of life and other silly things now! Big thanks to Sean for the new version ! After numerous of rumors that the Beta version of MSN Messenger 6.2 is available to its testers, we haven’t seen a little bit of proof of its release yet. But we can update you with the news there will be a new fun and games application available called Upwords® Club. This makes a total of at least 4 new items in your launch site list. South Korea's largest Internet portal, Daum Communications Corp., launched a 10 billion won ($9 million) antitrust lawsuit against Microsoft yesterday, demanding that the U.S. software giant excludes the Windows Messenger software from its Windows XP operating system. "Microsoft continues to abuse their market dominance in computer operating systems by bundling the Windows Messenger into their Windows XP software [...] Daum Communications suffered significant losses with its instant messaging services due to Microsoft's unlawful actions," said the company. The lawsuit comes less than a month after the European Commission fined Microsoft for a record 497 million euros ($600 million) for antitrust violations and ordered them to exclude Windows Media Player from their Windows operating system and make available some of the operating system's source code. Microsoft is expected to appeal against the commission's ruling. Added more than 200 new display pictures including 30 of my favorite actress Jennifer Aniston submitted by Teex. Huge or extremely tiny display pictures are allowed now in MSN Messenger thanks to this plugin for Messenger Plus!. Now if you have the plugin installed and still want to switch back to the conventional 96x96 px dimensions we recommend installing Timothy's Internet Explorer Display Picture plugin 2 for easy display picture chosing while browsing the web or images on your hard drive.